2018 Rodeo Schedule (PRCA) Professional Rodeo Cowboys Association so you can stay informed on all the rodeos taking place around North America. For fans of pro rodeo, there is no greater thrill than sitting on the edge of their seats watching the best competitors in the world try to become champions in arguably the roughest sport in the world. Therefore, it’s important for fans to be able to keep up with the PRCA events that will be coming to a city near them. To do so, they often turn to the Professional Rodeo Cowboys Association Event Calendar and Coverage that’s found exclusively on CowboyLifestyleNetwork.com. As one of the most family-friendly sporting events in the world, PRCA events have become some of the most popular bull riding associations in the world. With a media team consisting of the Cowboy Lifestyle Network, Ak-Chin Indian Community, Earnhardt Auto Centers, and Papa John’s Pizza Road Team all providing extensive coverage of the many exciting events, fans everywhere will have access to the latest articles, videos, and photos of all the excitement occurring at all Professional Rodeo Cowboys Association events. While everyone may be wondering who wants to be a millionaire, that’s one question Wrangler National Finals World Champion Sage Kimzey doesn’t have to worry about. At only 22 years old, Sage recently surpassed the million-dollar mark in career earnings, showing his intense dedication to the sport. In addition to this impressive earnings feat, Sage has won three consecutive PRCA bull riding championships, making him the only cowboy ever to win championships in his first three seasons competing in Professional Rodeo Cowboys Association events. As families get more and more excited at the thought of seeing these great pro rodeo athletes in action, the good news is that numerous events are scheduled in many of the nation’s cities. By taking advantage of the event schedule for these exciting events, pro rodeo fans across the United States will be able to mark their calendars and plan on attending an exciting event with family and friends. 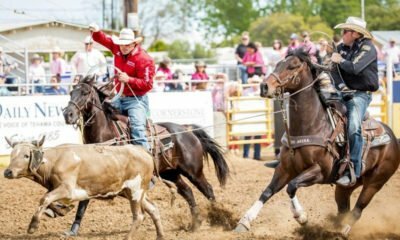 If you’re eager to see if Sage can win a fourth championship or if another cowboy can take away his crown, put on your cowboy hat and boots and catch the action at an event near you. The Professional Rodeo Cowboys Association’s headquarters is located in Colorado Springs, CO. According to prorodeo.com, the PRCA sanctions over 600 rodeos, between Canada and the United States. Stay tuned into CowboyLifestyleNetwork.com as the Ak-Chin Indian Community, Earnhardt Auto Centers and Papa John’s Pizza Road Team attend and capture various PRCA sanctioned rodeos across North America. Cowboy Lifestyle Network is working hard to get you the best PRCA rodeo highlights, so be sure to leave comments to let us know which rodeo you would like to see us attend!